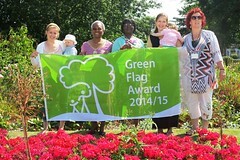 Our events are all about getting the different parts of the local community involved in the Gardens. The Easter Egg Hunt (2003) was the first event FSPG created. This was followed swiftly by the Fireworks in 2004 and then with the aid of the Heritage Lottery Fund and the Park Warden we started the Teddy Bear’s Picnic, the Over 60s’ Tea and supported the Music Festival. We also took over the organisation of the annual picnic, which was first started in the 1970s! The events are vital to us as fundraisers but more importantly they involve local people in the Gardens. Don’t forget to also check out our Fitness classes here. Gardening Club – FSPG Gardening Club meets most Sundays 10-12pm. Tools and coffee provided but please bring your own gloves and wear appropriate footwear. Have a look at some of the lovely events going on in the Garden Pavilion. You can see this in calendar form here. Saturday 10.15 to 11.45am 12th and 26th November. This is for Beginners/General Level. Any questions, please contact Rebecca Spong on 07736 104377 or becca81spong@gmail.com. Cost £10 per class. Feel free to attend all four classes and drop in as and when it suits you. Sunday 11 June 10-12pm. Painting on pottery for all ages and abilities. Great presents for all family and friends. No need to book, just come and pick an item to paint. Studio fee per painter £4 and items start at £3.50. Contact Bini Slingsby 07793 316212 for more information. Mondays 9.30-10.30, Contact Claire on 07577143676 or claire@clariayoga.com. £12 – single class. £60 – pack of 6. Wednesdays 9.30-10.30 – contact Claire Ng-Martin on 07577143676 or claire@clariayoga.com. Thursdays 9.30am to 12.30pm Art class for adults in South Park Gardens on 8, 15, 22, 29June. Please contact Nick for further information – studionicholaswyatt@gmail.com or call Nick on 0741 396 3699. Details can be found on the facebook page here! Fridays 9.30-10.30 – contact Claire Ng-Martin on 07577143676 or claire@clariayoga.com.